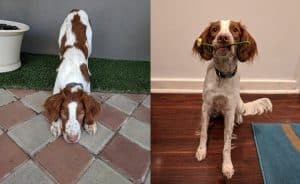 Anyone who has had the pleasure of owning more than one dog during their lifetime knows how different each dog’s personalities and behaviours can be! If you’ve been fortunate enough to have a seemingly perfect dog that gave you nothing but joy from day one, count your blessings. The odds are that your next pet will need dog training to come anywhere close to the same great behaviour. The key to successfully training a dog is to open the doors of communication between you. You can’t just tell a dog what to do and expect him to understand and obey. The same goes for what you don’t want him to do. The dog training courses at Kalmpets serve as the foundation for opening communication between you and your dog. We tailor our courses to you and your dog’s lifestyle and the goals you have for the future. Our exclusive KALM Dog Training features one-on-one training sessions. 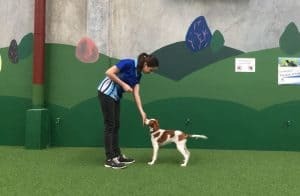 The end goal is to improve the human-to-animal bond and to educate you on dog behaviour and best practices in positive dog training techniques. If you’ve tried scolding your puppy, you already know that this approach doesn’t work. Although you think the problem is very obvious, your dog doesn’t understand what he’s done wrong. Without this type of structure in both your lives, your chances of having a well-behaved dog are virtually non-existent. Instead of scolding when your puppy does something wrong, we use positive reinforcement when he gets it right. Once he realises he is being rewarded for the right behaviour, the problem behaviours begin to diminish! At Kalmpets, we know that a calm pet is the best candidate for our dog training program. We rely on evidence-based strategies to make communication between human and dog genuinely possible. We know that all dogs are different and we take a custom approach with each dog. That’s why you can expect to have an enjoyable experience from our dog training courses. It’s fun and productive for you and your dog! The dog trainers at Kalmpets take an holistic approach to dog training. 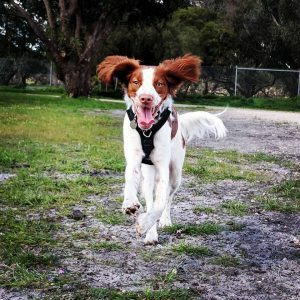 We consider the features that set your dog apart and use techniques that have proven successful in similar situations repeatedly. The frustration you’re experiencing doesn’t have to be the norm. Our expert team of trainers knows how to get the right information from your dog to get the response you want. You and your dog are partners in whatever you do. Let us help make your partnership a strong and happy one. Classes will focus on teaching you how to get your dog to listen to you the FIRST time as well as cover essential training techniques. Classes are held over a 5 week period and cost $195 and are run at Saturday mornings. Tricks will be designed to suit the dog’s abilities in the specific class. The beginner lessons will include tricks such as: Pick up an object, drop/give an object, spin, go to target, open a door, leg weave, figure 8, hoop jump, turn on a light, bow and hand target. 4 week course for $195. We also offer 1-on-1 trick dog sessions, $250 for four sessions where you will receive a course structured to suit you and your dog. Recallers is a fun and informative 4 course held on Saturday mornings. The aim of the course is to gain a thorough understanding of what is involved in getting your dog to come to you when you call. A dog’s nose is so sensitive that they can detect the equivalent of 1/2 a teaspoon of sugar in an Olympic-sized swimming pool. Scentwork is a dog sport which allows your dog to use their incredible sense of smell to fulfil their natural desire to hunt, forage and explore. Designed to mimic the work of a detection dog, the classes involve training your dog to search a specifically trained odour and alert their handler to where the scent has been found. Scentwork can not only improve the human-animal bond but also build your dog’s confidence levels, self-control and focus, while providing your dog with a fun and mentally stimulating activity. The Scentwork beginners class will be held on Saturday mornings at 9.30am every week for four weeks and each session runs for approximately 45 minutes. Do you want to discover what learning agility is all about in a fun, safe and secure environment? We have added a new group class to our Kalmpets Canine Sports Academy. The class follows the same format as our current “Click Start Agility” one-on-one private lesson program. 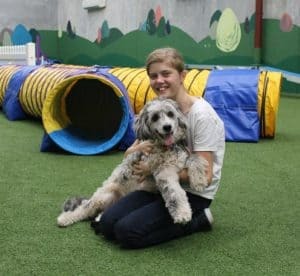 Want a fun activity for your child and dog this school holidays? Our School Holiday Fun program is designed for children 8 years of age and over. 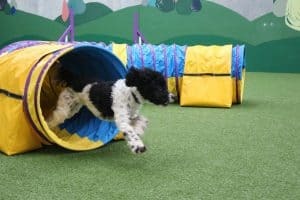 During two sessions held over one weeks, your child will learn how to teach their dog to go through tunnels, up and down ramps and over jumps. These classes are designed to mentally stimulate and exhaust your dog while providing the kids with a fun and unique way to build and strengthen their relationship with their dog. Agility classes for children are run at 11am. Puppy confidence classes aim to provide you and your puppy with crucial information to help them build their confidence and develop important life skills. We will introduce your puppy to a variety of new smells, textures and sounds in our daycare environment. We introduce each puppy to a range of obstacles to go up, over and through, which will help to teach body awareness and confidence. 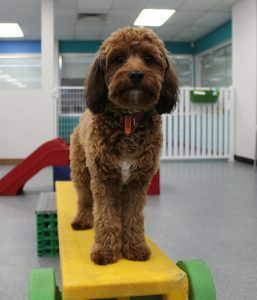 Your puppy will also get to explore through the enrichment zones in our daycare. Your puppy will learn how to learn using fun trick training and shaping techniques (we will introduce clicker training). These unique and educational puppy classes will focus on increasing the human-animal bond.